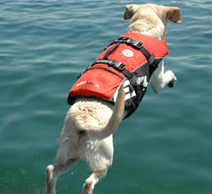 Since all dogs don’t swim well, contrary to popular belief, a dog life preserver is a piece of safety gear you should have on hand when you plan on playing with your pet near water. Even if you plan on being in a boat or on shore without ever dipping a toe into the surf, a dog life vest is a great idea. Your dog could fall out of the boat or end up in the water somehow. The life preserver will help him stay above water even if he’s tired, scared or unconscious. 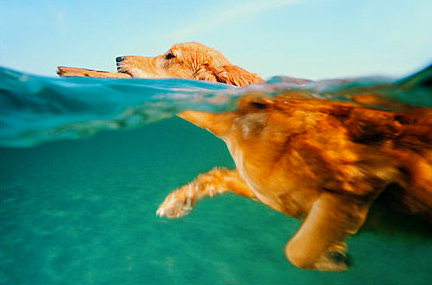 Fortunately, most days spent in or near the water won’t see your dog tired, scared or unconscious. Chances are that you and your pet will have a lot of fun with no problems at all. There are some things to watch out for, however, that don’t have anything to do with whether or not your dog is a strong swimmer. If you’re taking the gang to the lake or the beach, and your dog and kids love to swim, make sure that they don’t swim too close together. Your dog could scratch a child without meaning to by simply dog paddling enthusiastically. Be sure your children are wearing flotation devices of their own while swimming near the dog, as well. A sudden scratch or bump could startle a child and cause problems. Watching carefully while they play together is important. Also, make sure your dog gets plenty to drink and isn’t kept in the water too long. A dog in water deep enough to prevent him from standing can get tired out quickly from the constant movement. Offer plenty to drink in something like a collapsible dog bowl from EzyDog. Your pet can get dehydrated quickly from the exertion, especially on a warm day. By offering plenty of fresh water, you can help prevent your dog from drinking water that could contain things that may cause diarrhea and vomiting. Both chlorinated water and stagnant water can cause illness, so bring bottled or tap water from home. Aside from using a life jacket for your dog and making sure he gets enough rest and water throughout the day, you should also be aware that your dog might need different healthcare from being in the water. Water trapped in the ears could cause ear infections, and occasionally a dog’s skin might become irritated from swimming. Also, some bodies of water contain certain microscopic parasites that dogs can catch. Treated pool water is typically clear of these, but lakes, streams and other bodies of water might expose your pet to parasites like leptospirosis, which can actually spread from dog to human and make both very ill. A yearly vaccination can protect your pet against that, and other similar measures can be taken to prevent against other water-borne diseases.